Even on Sunday, I was still in a post-Thanksgiving Day stupor–watching football with the sound turned down. But when the news came on, I was wide awake.I saw a picture of a woman who was unmistakably Asian. 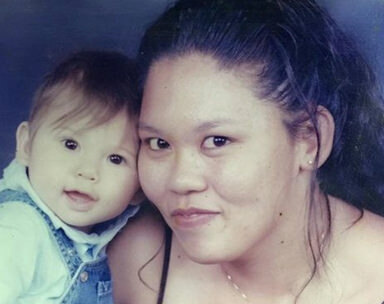 She was one of the three victims of the Planned Parenthood shooting in Colorado: Jennifer Markovsky. Names can always throw you off. But the face of the woman, holding a young toddler. There was no doubt, Markovsky was Asian American.Born Jennifer Ah-King of Waianae, Honolulu, 36 years ago, I saw her face and felt like I knew her. I lived in Honolulu for two years and would go to Waianae on West Oahu to get away from paradise. Waianae is not for tourists. You’ll find homeless people on the beaches. And see real people like Jennifer Ah King, who worked at the Tamura Super Market, where her mom still works as a clerk.When I learned about Jennifer Ah King’s story, it sounded so familiar. A young woman meets a military man stationed in Hawaii (Paul Markovsky), marries and moves to the mainland when her husband is re-assigned. She has two children, and gets the chance to live happily ever after.The story shouldn’t end being gunned down at a Colorado Planned Parenthood.On Friday, her father, John Ah King, said he had just messaged his daughter to wish her a Happy Thanksgiving. When he learned the news, he posted on Facebook:“To my daughter Jennifer I’m going to miss so much , I lost you in a senseless shooting in Colorado Springs, Plan Parenthood , life was to short my beloved daughter , I was waiting to see you soon , I’m going to miss you , my memory’s of you will live on in my heart and mind ! Missing you !!! ”As one who has lost a relative to senseless gun violence (you can read about my cousin Stephen here), every new instance of gun violence re-opens the wound, and adds a new one.America has become bullet-ridden.With each new story, I have tried to insulate myself from what has become a more common occurrence in our modern world. Or if I cannot escape the news, I just try to wait until the full story comes out. The shooter. The circumstances. The issues. When the Paris attacks occurred, it really didn’t matter if Nohemi Gonzalez was Filipino or Hispanic. Unless you write for Asian American or Filipino American media like I do.But that’s the routine for someone like me in the ethnic news business. Is the shooter Asian? Are the victims Asian? And then we wait for justice. Or for some action. We usually get nothing.President Obama knows how routine it all has become. “We can’t let it become normal,” the president said in a prepared statement over the weekend. “If we truly care about this–if we’re going to offer up our thoughts and prayers again, for God knows how many times, with a clean conscience–then we have to do something about the easy accessibility of weapons of war on our streets to people who have no business wielding them. Period. ”It has become his boiler plate response to an unresponsive political body.But real people are grieving. Asian Americans are grieving. In Hawaii, John Ah-King is grieving.